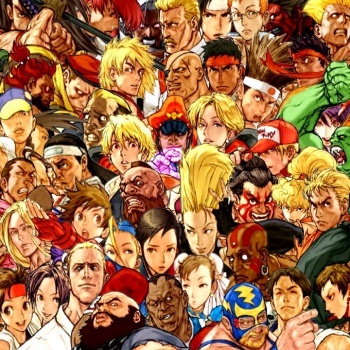 Capcom has almost completed work on bringing its PlayStation 2 incarnation of Capcom Vs SNK 2 to the PlayStation 3. In our modern console generation, Capcom has made beaucoup bucks by reviving its older fighting game franchises for newer hardware. The recent Darkstalkers Resurrection is a perfect example of this. Thus, when fans asked the company en masse to revive Capcom Vs SNK 2 the company responded with, "Don't worry, we're already on it." Unfortunately, that was months ago and we've heard little on the project since that time. Yesterday though, a curious fan decided to ask Capcom's senior vice president Christian Svensson about the project's status and was met with an unexpectedly candid response. "Current schedule for the release of the PS2 game is the end of April... mind you, if Sony chooses, that could move (it is later than I had originally anticipated already)," Svensson stated on the official Capcom Unity message board. Exciting news, right? Absolutely. Capcom Vs SNK 2 is one of the best crossover fighters Capcom ever created, yet it hasn't been readily available for purchase since the previous console generation. Those willing to track down a used copy of the game (in either its PlayStation 2, Xbox or GameCube incarnations) will quickly find that the few people willing to sell their extant copies of the title usually jack up the price to unreasonable levels -- a problem that's exponentially worse if you hope to buy a copy in its original packaging. Fortunately, the upcoming PlayStation 3 release should feature a sub-$20 price tag, and as a digital release there will be no hard limit on how many copies of the title can be distributed to prospective players. Unfortunately, it should be noted that unlike many of Capcom's other revivification efforts, the PlayStation 3's Capcom Vs SNK 2 won't feature any new additions. Instead it's a simple port of the PlayStation 2 game as part of Sony's "PlayStation 2 Classics" line of PlayStation Network downloadable titles. Still, this iteration of the game was quite excellent and featured a large swath of extra content not found in its initial arcade release. There likely won't be any online multiplayer options, but at least now interested players will be able to pick up a copy on the cheap. Expect more word on this release as soon as Capcom receives an official release date from Sony. Hopefully that comes sooner, rather than later.